It ain’t easy being a productive marketer in these modern times. We have more things to do, ways to do them, and methods of staying “connected” to our teams and our customers. But what is the personal cost of that productivity? Fascinating new research from Workfront and Harris Poll reveals some answers. 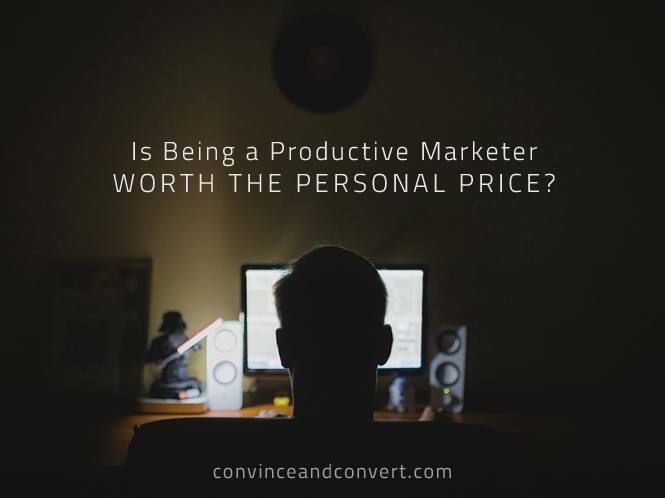 Marketers feel pretty darn good about being productive. In fact, 92% of marketers surveyed said that they are productive (although there may be some self-fulfilling prophesies in action there). The survey didn’t mention the demographics of the 207 marketers who responded, but I’m going to go way out on a limb here and say that most were Generation X. Why? Because 22% of research participants said Baby Boomers at their company are the most productive. A whopping (and perhaps self-congratulatory) 58% said Gen X was most productive. 20% said Millennials are the most productive cohort of company employees. But what does it require to consider yourself “productive” today? That’s really the question, and in short, the answer is “a lot”. Among those that skip the loo, they do so an average of 4.3 times per week. I’m very much in this camp now, as who has time to pee when there are tweets to be sent and podcasts to be recorded? But, I am old enough to remember a different time when calling for a “bio break” in a meeting didn’t qualify you for sainthood. Work hours are similarly changed. NINETY PERCENT. That’s remarkable. And damning. Are we actually better at marketing now, or are we just beholden? Again, I remember the b.s. age (before smartphones). Back then, when you walked out of the office you were done until Monday. So why do we do it? Why are marketers crossing their legs, and checking email during their kids’ soccer games? According to the research, it’s a melange of rationales, but the most often cited—by 52% of respondents—is “to get ahead of the work.” That treadmill feeling that your to-do list will never end is all too common, and familiar to me as well. One of the other primary reasons marketers are working so hard is “to look more dedicated than my colleagues,” cited by 17% of participants. So at least in part, hyper-working is a self-inflicted wound from not setting limits, being technologically tied to work at all times, and trying to climb the ladder of “success”. But there’s another, often unspoken factor at play: company culture. 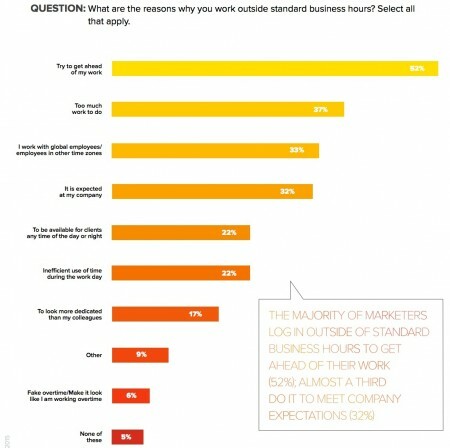 32% of marketers say they work long hours because it’s simply expected at their company. It’s this culture of “working ridiculously hard is a badge of honor” that I ranted about in this episode of my Jay Today video series, as I see young entrepreneurs falling into the “hustle” trap time after time. It’s a common requirement of being a professional marketer in many companies. Working extra hard is simply what you’re supposed to do, because marketers before you did it, and if you don’t like it the company will find someone else to do it. I know a lot of marketers, and if I had to categorize their collective attitude about all this work it would be “weary resignation”. But is this really the best scenario for us? For the marketing professional? For the companies we serve? Not to mention our families? I feel fortunate that I at least got to begin my career in the pre-Internet days, where the pace was different and the expectations as well. Many of the young marketers with whom I work—not to mention my kids—will never know a time when taking a piss wasn’t perceived as some sort of guilty pleasure.